Following the news of Meltan being the newest Mythical Pokemon found in the World of Pokemon, the same that can be obtained in Pokemon: Let's Go, Pikachu, it has since been revealed that Meltan will also be able to evolve. This marks the first time in the history of the Pokemon Franchise that a Mythical Pokemon will be able to evolve! 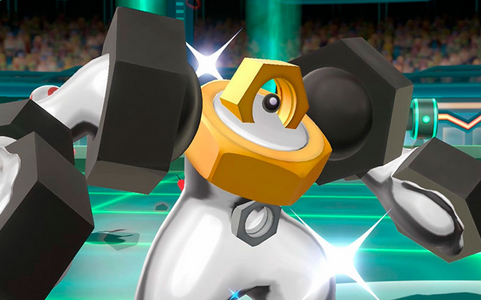 Meltan's evolution will be called Melmetal, and it, too, is a pure Steel Type Pokemon. Melmetal will also receive a special move called Double Iron Bash, and as the name might describe, it will hit foes with a powerful attack twice on the same turn. In order to evolve Meltan into Melmetal, a player will have to first transfer Meltan from Pokemon: Let's Go, Pikachu to Pokemon GO. From there, they will need to obtain 400 Meltan Candy to evolve Meltan into Melmetal. After all of this, then can then transfer Melmetal back to Pokemon: Let's Go, Pikachu.